In addition, her law firm also has an outstanding success record in such areas of business law as enforcement actions and contract disputes, as well as alternative dispute resolution and mediation. Whatever business or technological issues her clients are facing, they know they have a strong advocate in NKD Law. 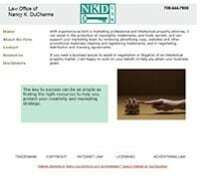 Throughout the entire process, from the free initial consultation to necessary research and strategy development to successful resolution, Nancy K. DuCharme provides each client with the personalized respect and attention to detail that he or she deserves. She takes the time to get to know each client and understand his or her goals, objectives and concerns. In addition, her law firm accepts all major credit cards for her clients' maximum convenience.